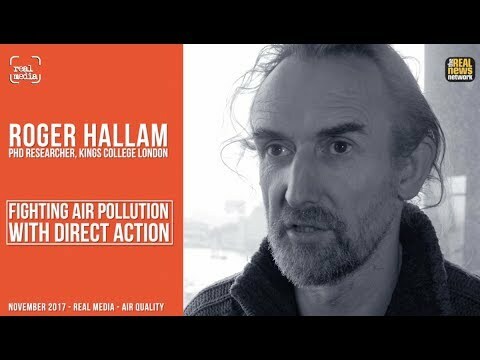 Roger Hallam:	I’m researching ways to make radical campaigning more effective. Campaigns in the present environment need to do more nonviolent, direct action in order to get attention in order to leave a significant change. And in the last 30 years, this hasn’t really been done in a very effective way or hasn’t been done at all. I’m not sort of suggesting anything particularly new, say what Martin Luther King did and Gandhi before that but I’m trying to update that in the context of, you know, neoliberal London as you might say. And specifically what that means is people getting arrested, people going to prison, people going on a hunger strike. Those sort of tactics need to be reintroduced to a sort of radical political culture. All the main social movements of the past before 1989 were successful because they engaged in those sort of tactics. It’s all right being a suffragettes, trade unionist, going to prison, getting arrested, that’s part of the deal, empirically speaking. I don’t run different campaign groups in London, for better or worse, trying to sort of introduce these sort of tactics and strategies with varying degrees of success, you know it’s a learning process and some things work better than others. But the upshot of it is, is generally speaking, you know they can be highly effective. We helped to create the first successful rent strike in London. We had an eight week lightning campaign here that involved spray chalking the walls at King’s College and a hunger strike by myself to pressure the King’s College management to agree to divest from all fossil fuels. This is something that a lots of campaigns are involved in, but to my knowledge nothing’s been as successful as the one that we engaged in. And that’s primarily because we took a strong direct action and combined it with a respectful attitude toward the opposition as it were. The management said they felt they could actually do a deal with us. So, those are the two key criteria that has come out of my research, which is, you know, practically orientated, you know, I just made it up in a room. It’s been tested several times. So, what we’re moving on to now is moving from like dealing with specific institutions like casualized worker employers or universities or what have you, to the London government. And what we’re experimenting with, I suppose, in a Gandhian sort of sense, is whether we can pressure Sadiq Khan to bring in more vigorous policies to deal with the pollution crisis in London. There’s 10,000 people dying each year in the city and thousands of children’s lungs are being disfigured condemning to a lifetime of breathing conditions. So, in terms of what we’ve been doing so far, we started in July. Basically we’ve got like a three or four month plan to have escalating direct action. That means we start off quite sort of softly, as it were. We sent a letter to the Sadiq Khan asking for a meeting. We still haven’t sort of secured that, so we’ve gone onto next stage. The first stage was just blocking streets for 10 minutes, having a disco making it quite sort of soft and light and breezy as you might say, introducing people to low level civil disobedience. And because we haven’t yet sort of got a bite of the cherry, we’re escalating. So this week, people are getting arrested every day or so. And then people in the campaign are now prepared to go to prison, possibly go on hunger strike in order to pressure Sadiq Khan to have a meeting with the campaign. That’s what we’re asking for. And at that meeting we’ll be asking for more vigorous action on air pollution. So, it has a specific aim. We’ve got specific demands, and we’re coming out, hopefully coming out, with a specific win. That’s the essence of it. I think increasingly the public does know it’s a big problem. I think the problem is, is it’s a very big problem to deal with because people pretend that you can use a sticky plaster sort of policies like the tea charges those command 10 pounds a day. So, for 10% of diesel vehicles to drive in London or whatever it is, is not going to do anything other than, you know, fulfill a PR exercise for the politicians. Objectively, it isn’t going to do anything to dent the 10,000 people that are dying every year. It’s just a fact of the matter. Our analysis, as in lots of political struggles, is the politicians are basically calculators. They are not moral actors as such. They more weigh up what will get them elected, and what will keep them in office and what will give them a good reputation. So, the name of the game in this sort of context is to increase the pressure for them to do the right thing because they are always under enormous pressure from corporations, and from the rich and powerful and all the rest are there basically to maintain the status quo. And to say that they need radical and concrete change is unrealistic. So, that’s basically the framing of the conflict. And the aim is to maximize the pressure to pull them to move in the radical direction. We completely, like sincerely, apologize for anyone that’s like got any delay in there day and also to the police who’ve got a lot of important things to do apart from dealing with protest. Having said that, what we want to communicate is that in a democratic society, disruption is an essential part of the democratic process. If you want to have a demonstration, you’re going to be disrupting traffic. If you want to go on strike, then the customers of your company are going to be disrupted. That is in itself, is not the issue. The issue is, is it justified in order to bring about a more just and democratic society. And in this case, we think it’s a no brainer that there’s thousands of children having their anatomies disfigured, if there’s thousands of people dying because the car industry doesn’t want to do the right thing, then it’s a classic example of where a civil disobedience is justified. I mean, that doesn’t take away for a minute the, you know, sincere apologies for the people who are disrupted. In this particular context, obviously highly problematic, because the fact of the matter is that Sadiq Khan constitutionally has very little power to actually structurally deal with the issue. That said, my understanding of the situation is that Sadiq Khan can do more. It can introduce charges which are higher and more progressive. It can extend the area in which there’s road pricing, and it can bring those measures in a lot earlier than it’s being pressured to by the car lobby. So, there’s free continuums that way, he can’t move, so that’s our specific game plan with Sadiq Khan. But it’s in the context of pressurizing the national government and the political elite as the establishment to say that this problem is not going to go away unless there’s full scale investment in green infrastructure. That means paying for people, you know, hard working small business people and all the rest of it. All these people don’t want to kill their fellow citizens, they’re just trying to make a living. So, what they need is money from the government to move from diesel to hybrid or electric vehicles. And then we need a significant and sustained investment in green transport, public transport so people are off out of private vehicles. So, all the experts agree that those are the two basic levers to solve the crisis. The problem is, of course, is that both of them totally like contradict the ideology of the Tory government which is to allow, you know, the free market or monopoly companies to have free rein in this city. So, there’s a big, you know, there’s a big conflict there. And as far as we’re concerned, I suppose this conflict is only going to get more acute as time goes on because it feeds into the whole climate change crisis of having to get out of fossil fuels in a matter of years, otherwise, as everyone knows in the establishment and in acting that we’re heading for a catastrophe.